For the second time in twelve days, the Police Department has removed an American type fragmentation grenade from south side, Belize City. 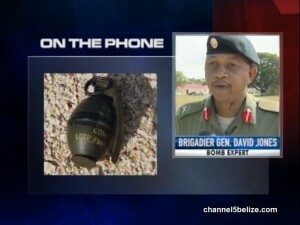 On Saturday, the police were tipped off about the location of the live grenade. Bomb expert and B.D.F. Commander, Brigadier General David Jones was called in to retrieve the grenade from Lake Independence Boulevard, which is the other side of Chetumal Street. General Jones says that the discovery was made early on Saturday morning, just after seven o’clock. Later on in the newscast, we’ll look at the impact of grenades in the past eight years. Please listen to him people. The K9 Unit has explosive detection dogs. Are they utilizing them as intended? Never hear about or see those donated assets anymore. I don’t believe the BDF or police genuinely find these grenade I think this is a fabrication stage so that GOB can start to kill people with grenade and give the public the impression it was some culprit who cause the killing. No criminal out there is so kind to just store a grenade and not use it. Criminals love to impress with new forms of crime so if these grenade were in the possession of a criminal they would have used it already. Also if the authorities genuinely found the grenade they would have commented about forensic test on the grenade to possibly find out who was handling it or they would have commented that they are investigating. Was Lords’ Bank House Fire Deliberately Set? Will Creditors Warm Up to Revised Superbond?